Durlach is now an eastern suburb of Karlsruhe, the German city on the Rhine near the point of the V, which is made by the German-French border. Durlach became part of Baden in 1211. 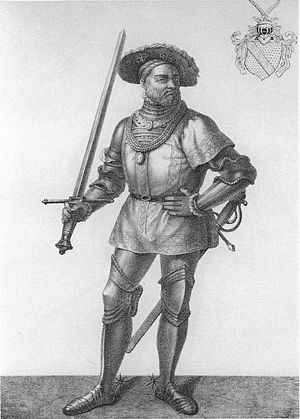 In the partition of the Baden lands in 1515, it was held by the second of three brothers, but after his death it passed in 1535 to Ernest, the third brother, whose share in 1515 had been the southern lands of Hachberg and Sausenberg. He made his residence at Pforzheim in the eastern part of these northern territories, but in 1565 the residence was transferred to Durlach and the line was known as Baden-Durlach from then until 1771 (and indeed is usually called by that name retrospectively from 1515). The fortunes of war temporarily deprived this, the Protestant line of Baden, of their lands, in 1634, but they were restored in 1648. In 1715 Durlach was replaced as the residence of the Margrave by the newly built palace of Karlsruhe. The Margrave Charles Frederick, who as a child had succeeded his grandfather as Margrave of Baden-Durlach in 1737, became Margrave of all Baden in 1771. He added greatly to his lands in 1802-3 and became Elector in 1803, only for there to be no Emperor to elect from 1806, in which year he became the Grand Duke of Baden. He died in 1811, in the 85th year of his life and the 74th year of his reign, a record-breaker. This entry was posted in Germany and tagged baden, Durlach, Karlsruhe, Margrave, Margraviate of Baden, Pforzheim, Rhine. Bookmark the permalink.